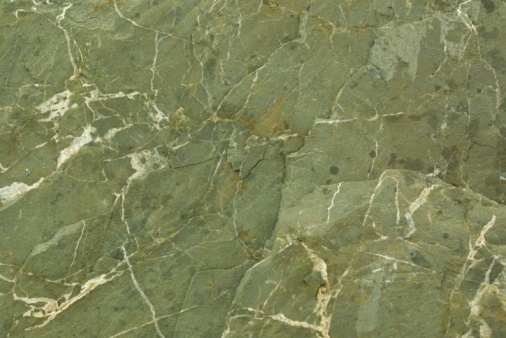 An unstable substrate or a natural fissure in the stone can sometimes cause marble tiles to develop a thin crack. In addition to being unsightly, these cracks can actually cause harm to your installation over time by being a conduit to moisture and weakening the overall integrity of the stone. Because marble typically has so many veins and fissures in it, a crack can be repaired with an epoxy compound that will blend in with the rest of the surface. Clear epoxy or a marble epoxy repair kit can be used. Often thin cracks repaired with clear epoxy will go unnoticed in a busy stone. Blow some compressed air into the crack to blow out any dust or debris that may have settled into it. This will help create a stronger repair because the epoxy will be able to bond better to the marble. Mix up the separate parts of the epoxy on the cardboard. If using a color matched marble repair kit, add the colorants and mix until the color of the epoxy closely resembles the area of the stone being repaired. Use a toothpick to scoop up some of the epoxy and apply it to the crack. Push the epoxy down into the crack as much as possible with the toothpick, adding more if it appears to sag or depress into the stone. Wait a few minutes for the epoxy to begin to set up. Use a razor blade to scrape away any remaining epoxy that may have gotten onto the marble surrounding the crack. The finished repair should be smooth and level with the surface of the marble.